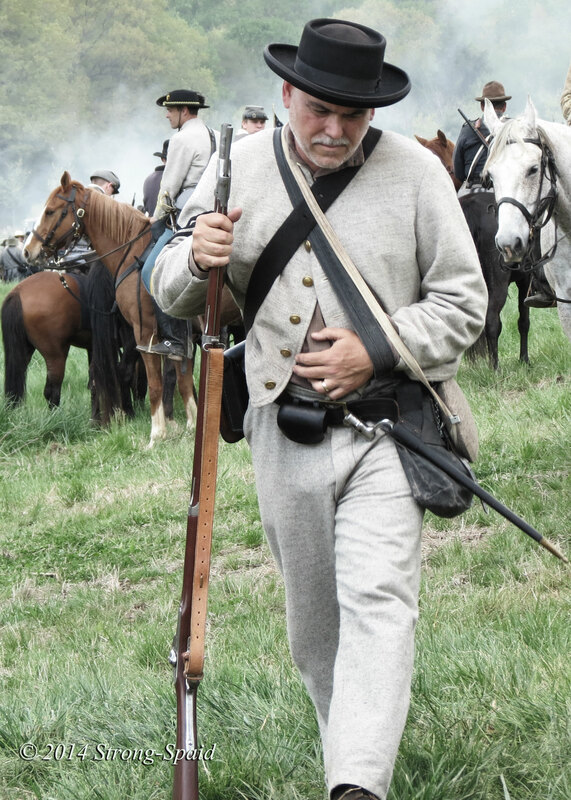 Admittedly, even though I have lived in Virginia for the past 20 years, this weekend was the first time that I ever attended a Civil War reenactment. 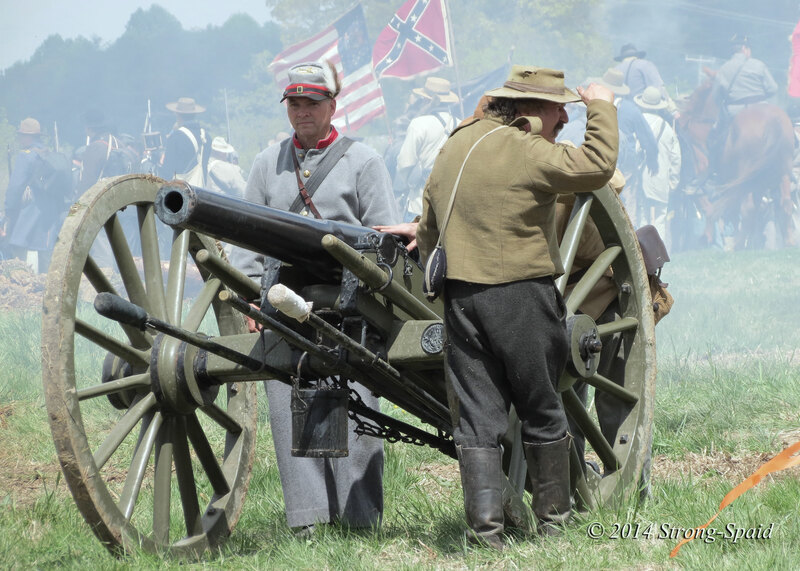 It was sponsored by Spotsylvania County and the Mason-Dixon Alliance (MDA), in commemoration of the 150th Anniversary of the Civil War Battles of Spotsylvania Courthouse and the Wilderness. 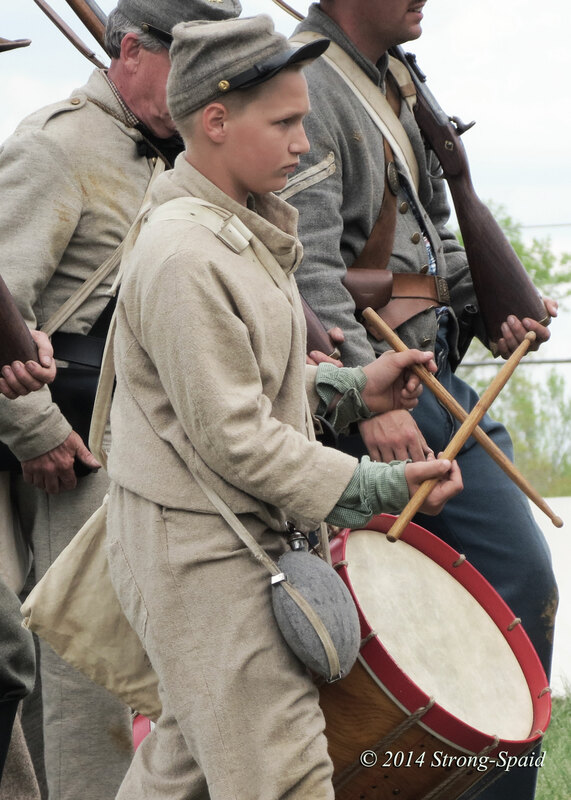 The original battles were actually held in these fields 150 years ago, during the month of May—so this reenactment was hauntingly real. I felt as if I had suddenly walked into the past and become a living part of American history. 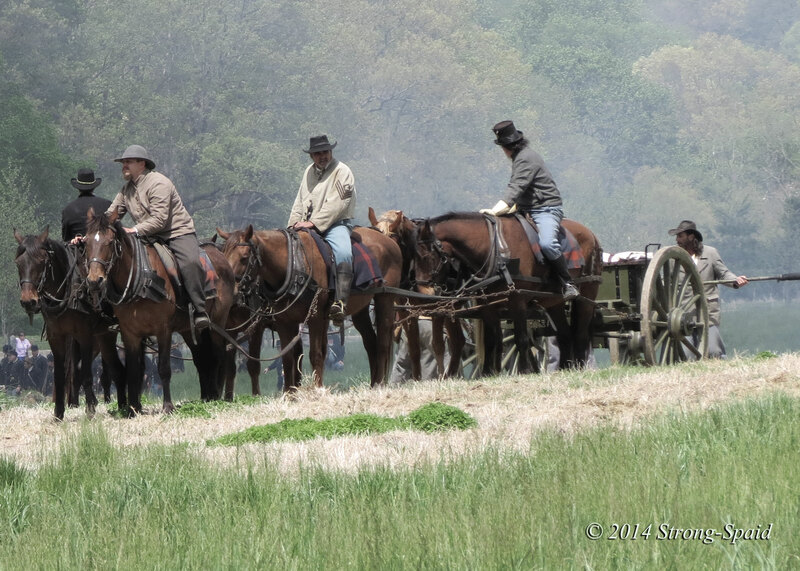 The ground was muddy and soaking wet, the grass was high, and the cannon fire was so loud (completely authentic) that the horses on the field jumped a little each time the cannons were fired. 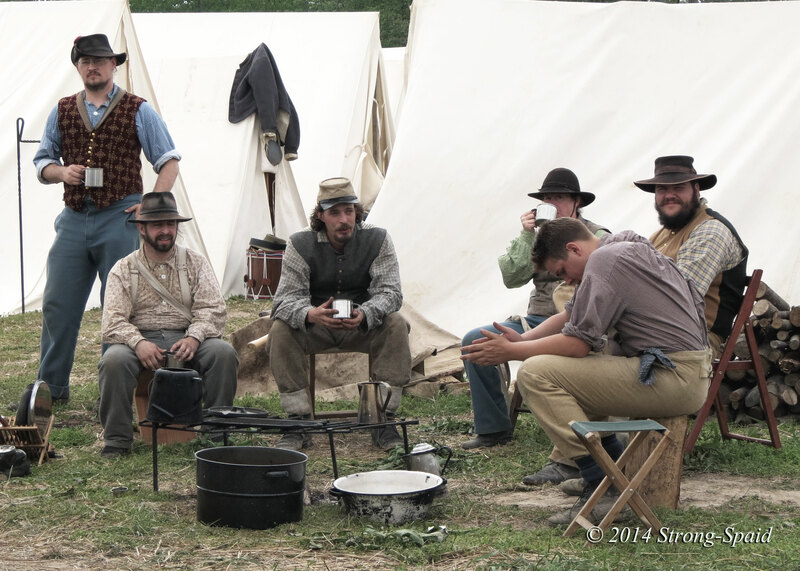 The time and effort that all of these soldiers (reenactors) put into this event was impressive. From the oldest to the youngest, their dedication and commitment was a great honor to the soldiers of the past. 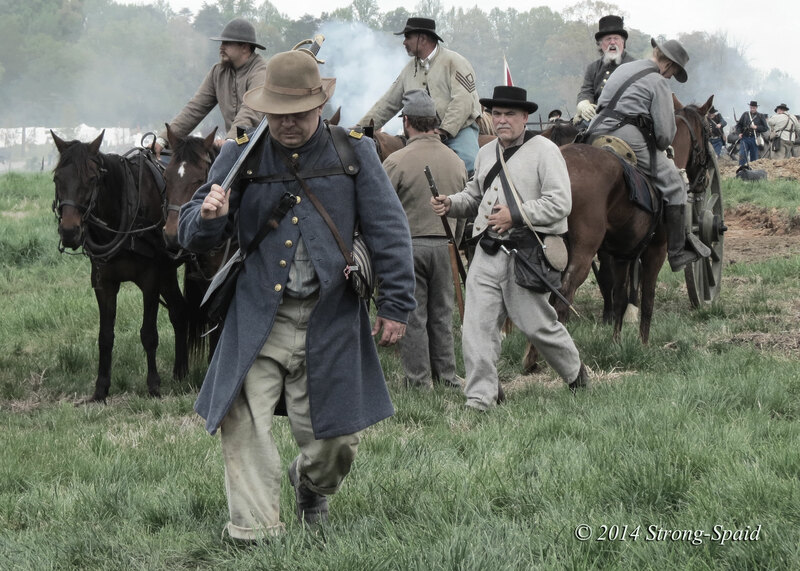 Most of my photos are of the Confederate soldiers, because I could not get around to the other side of the field where the Union soldiers were positioned. 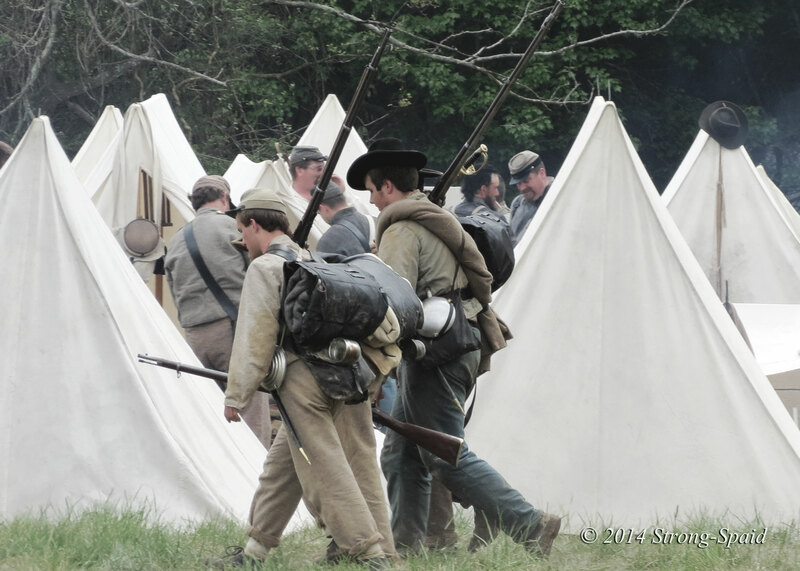 The area was already taped off by the time I arrived, and I didn’t have a “Press Pass.” As a result, I only have a few photos of the Union soldiers gathered together in the distance. After the battle ended and the smoke cleared, both sides returned to their separate camps. 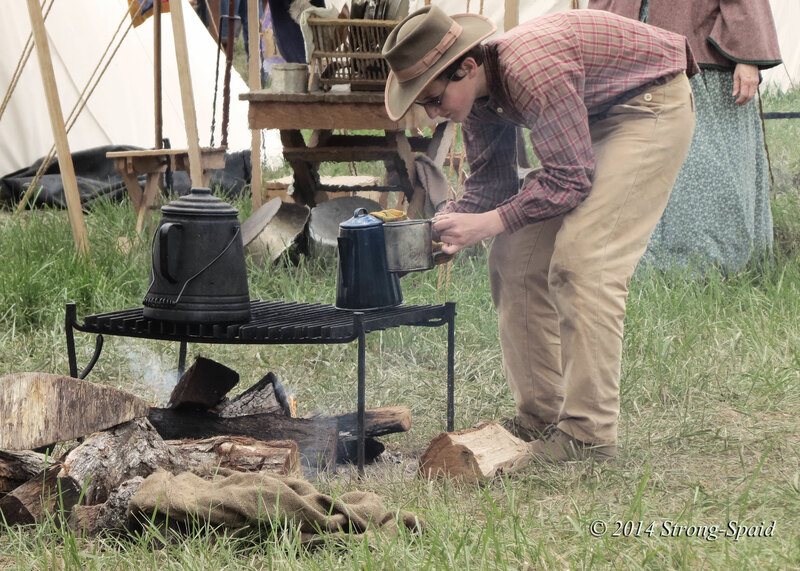 As soon as they settled in, I noticed that several of the soldiers began making coffee over open fires—no Starbucks here! The weather is supposed to be clear and cool, so I am sure that they will all get a good night’s sleep—before they have to get up tomorrow and face one more battle. 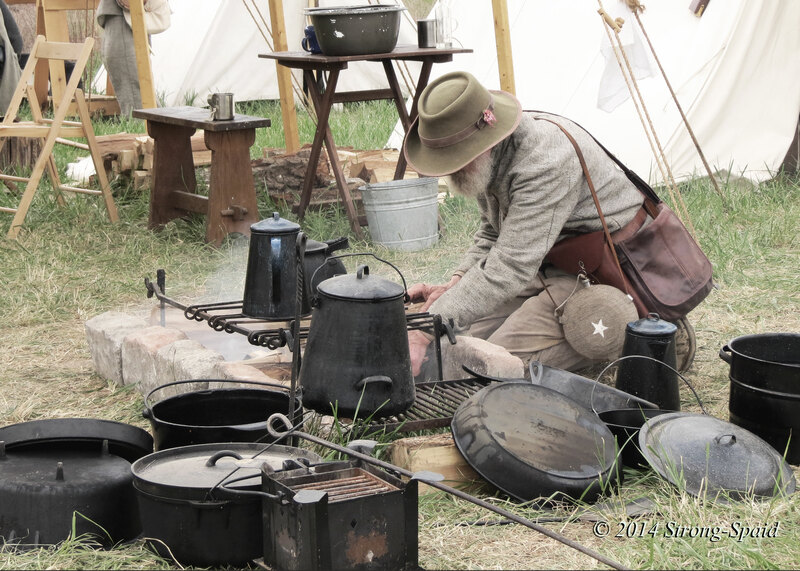 I returned to the present day with a better appreciation and understanding of what the soldiers endured during the American Civil War, so many years ago. 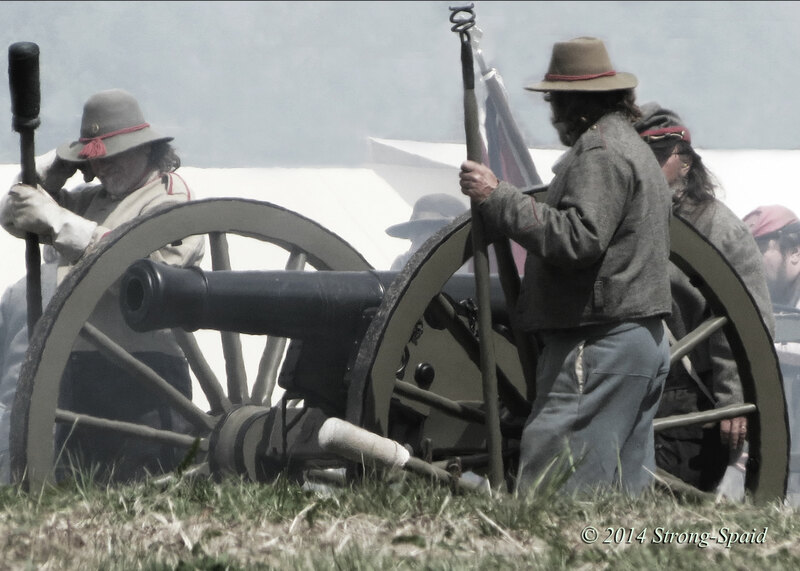 This entry was posted in History, Photo Essay, photography and tagged American Civil War, Battle of Spotsylvania Courthouse, Battle of the Wilderness, Cannons. Bookmark the permalink. Great photos! Love these kinds of events! I had never seen anything like this before. It really was like a walk into the past. There was a large amount of soldiers on each side ! What wonderful shots, Mary! 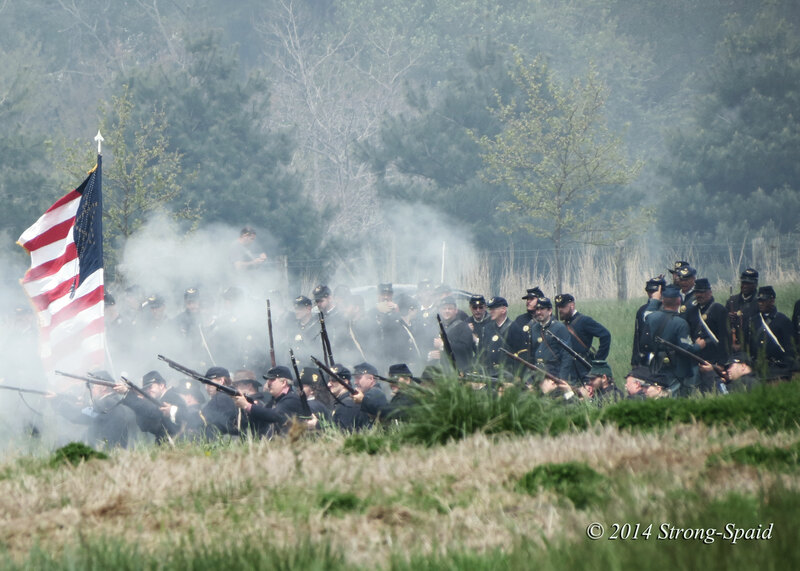 We had re-enactments of battles from the War of 1812-14 this past year … I should have made an effort to attend. I was thinking that too…so many events like this that I have missed over the years, because I was busy doing other things. It is much easier to learn and appreciate history when you are literally standing in the middle of it! Mary, I have always wanted to attend one of these reenactments. I so admire those who take part in them. Alas, this year was not to be, but your wonderful photos made me feel as if I was there. Thanks so much for sharing! I admire them too! They did a special reenactment on Friday–for school children only. Without the huge crowds that came on the weekend, the children were able to observe history up close and personal. Much easier to learn and remember something like this by watching….instead of sitting in a classroom and reading facts and dates from a book. How wonderful that they offer this. “Live theater” – the best for learning in my book! 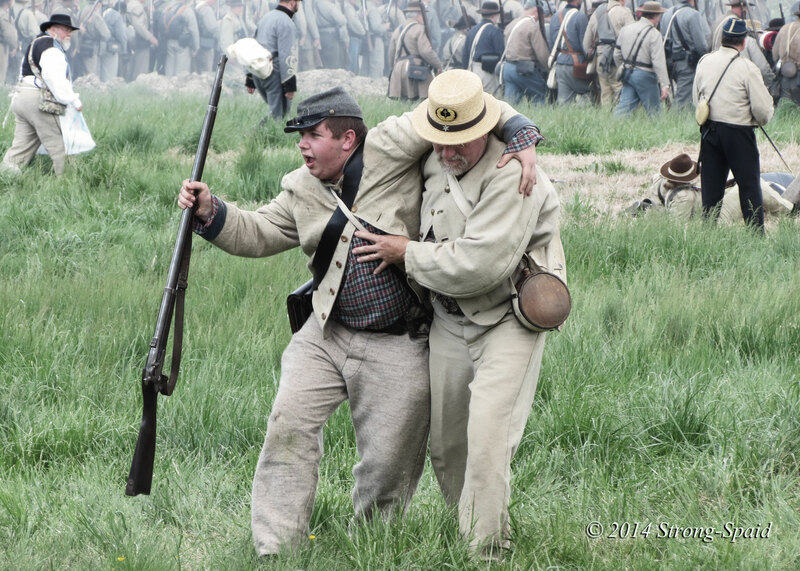 Terrific photos, brings back memories of our times spent in Gettysburg. 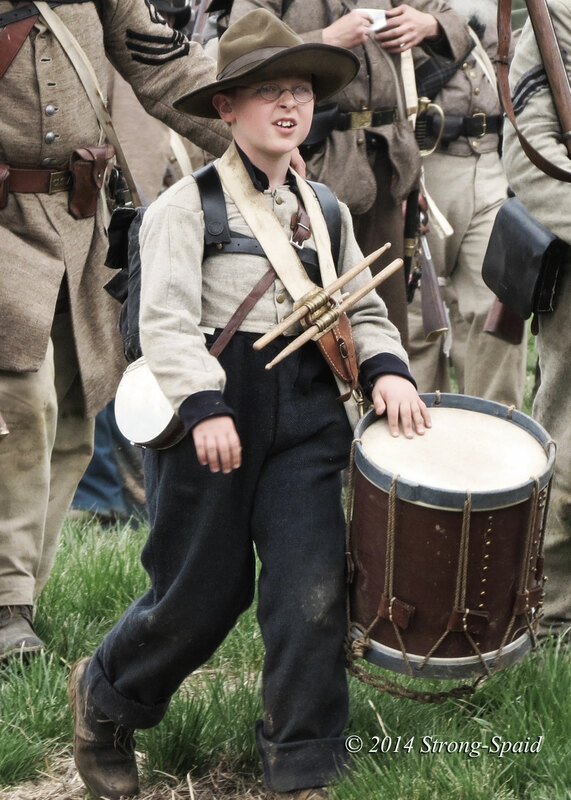 These enactments are a great way to learn history. Your pictures put us right there. Thanks Patty! I agree–it is a great way to learn history. When history comes to life, it makes more sense. When I went to school, we memorized lots of names, dates, and places so that we could pass History tests….and never really understood the true significance of the events. I enjoy learning history but not memorizing the dates and names etc….reading and seeing it first hand has deepened my interest that is for sure. Excellent photos Mary, and a great post. The re-enactment looked authentic, gold star stuff indeed. It did feel like I had gone back in time. All of the people involved did a great job. It would give you that feeling of being back there. What an outstanding performance done by all!! Your photos really show the enthusiasm in the participants. Thanks! It was definitely an honor to be there. (Note: Sam and Angel are now in the 2nd to last photo….I added one more photo at the end). Thank you! It was an amazing experience. All of your hard work and efforts were greatly appreciated. 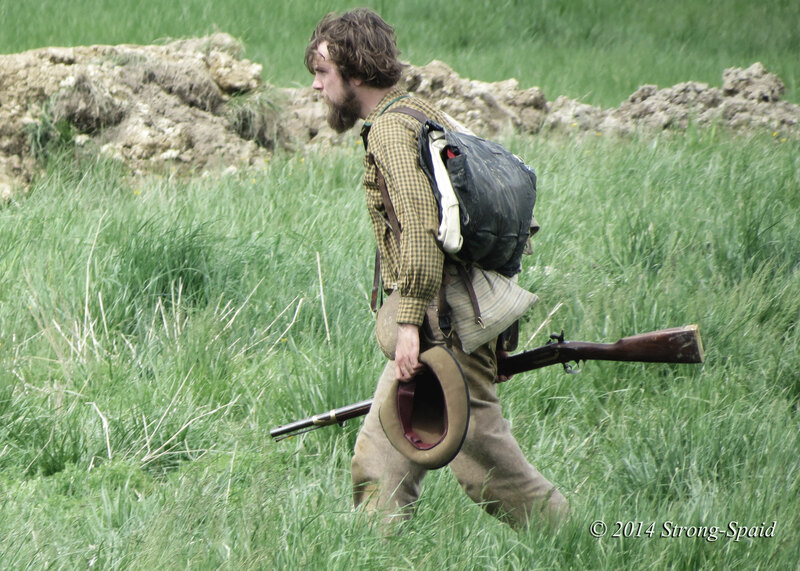 After the battle, I walked past a Reenactor talking to a young boy about the events of the day. The boy was listening to him with great interest. How wonderful that he was able to have the opportunity to learn about the Civil War from a person who has a deep understanding of it. Undoubtedly, the boy will remember this for the rest of his lifetime! Learning History this way is much better than expecting children to memorize names, dates, and places from a book. 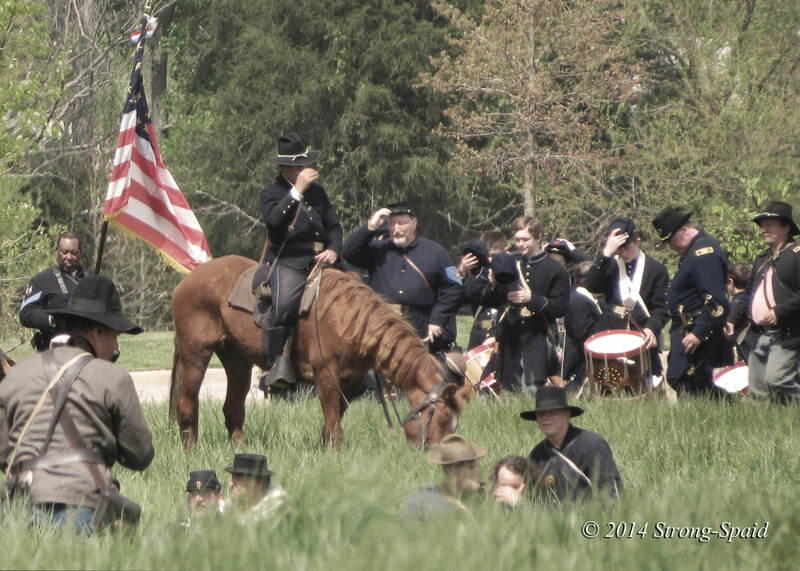 My thanks to you and all of the other Reenactors! A Very interesting series of photographs with a great narrative. Thanks! I was so lucky that I was able to take some clear photos through the crowd. 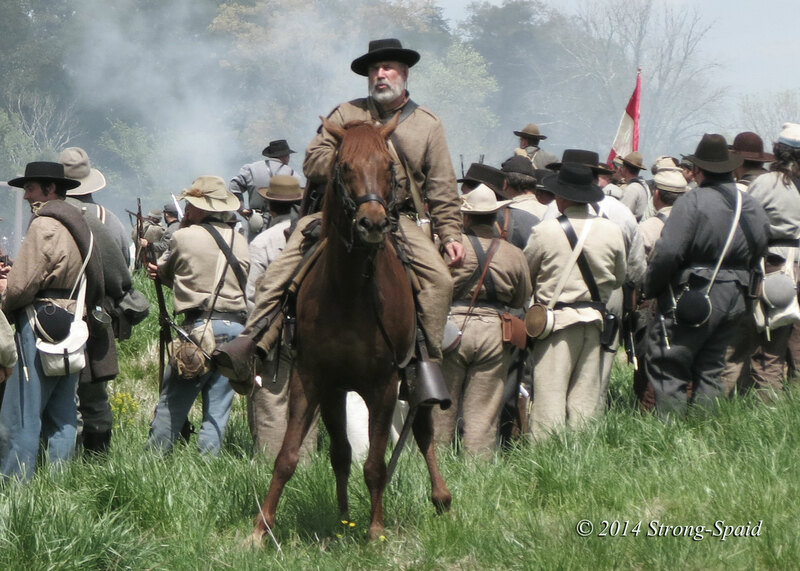 There were thousands of people there that day, who had come to see the reenactment. Amazing Pictures! This looks very very real! (The only thing missing there is the blood!) but thanks god!. I would love to attend one of this in he near future. Thanks! 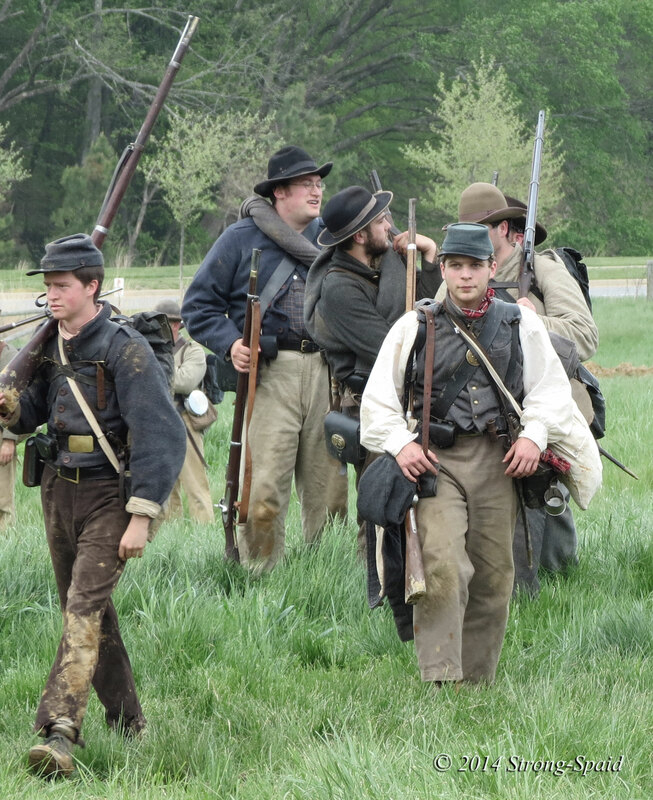 I guess the best way to find out about one of these in advance is to go online and search for Civil War reenactments… I think there are quite a few scheduled around the Virginia area this spring. You are right! Students would most definitely remember history lessons if it was tAught this way—hearing, feeling, seeing! It looks like a very fun day! Would you go to a reenactment again? If I had a “Press Pass” I would. it is a unique way of remembering past! loved the photographs! Thanks Sharmishtha! You are right. Instead of just “remembering” the past in your mind, this type of event allows you to physically walk right back into it! Yes, it is! It is good to know history. We can look back and see our successes, our failures, the good and the bad…..and use what we have learned as a basis for our decisions in the future. Wonderful photos and I appreciated your thoughts on this. In Italy we visited a medieval encampments and learned a lot about the daily life of soldiers in the field. Great performance, I have a feeling of being in the middle of it all! Thanks Dina…so nice to hear from you again!! Mary, you’ve captured it well in your photos. Living in the South, I, like you, have never been to one of these re-enactments and feel that it is something that I need to do. Thank you for sharing your day in the past with us. People were saying this one on of the best reenactments they have ever seen, so I guess I got lucky! Quantum leap! I went to a few of the 125th Anniversary cycle and one from the 130th Anniversary cycle when I lived in the East. There is an annual one just up the road here in California that is smaller but still good – in November so it isn’t hot and dry. Nice photos, I know from experience it is hard to get a shot at those things. Thanks! I was stuck behind a yellow tape barrier with a gazillion other people, so yes….trying to take photos between elbows and heads and lawn chairs….was a big challenge! Great photos! 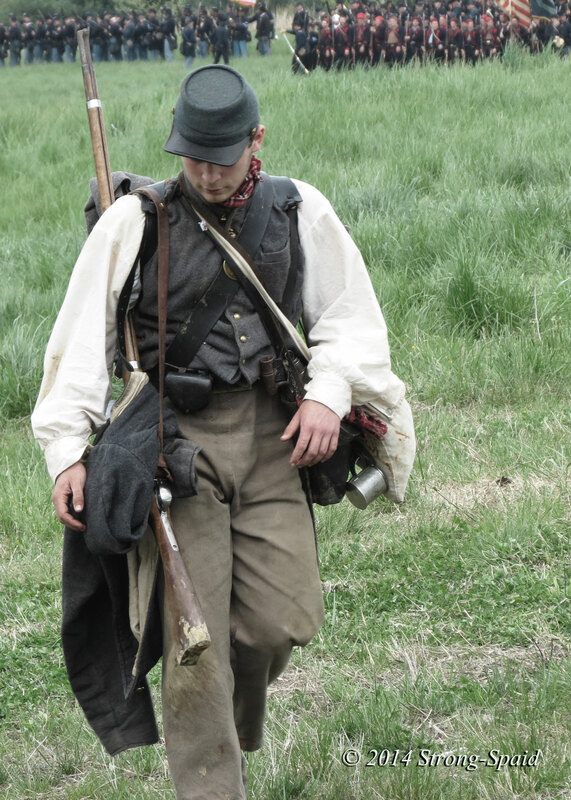 My brother-in-law was involved with a club that did re-enactments of the war on the Canadian side, near Niagara Falls. Your post brings back warm memories of him.in his authentic costumes. Thanks! I had never been to anything like this before. I was impressed! Wow!!! This was totally amazing. You have taken some great action shots of the event. Lucky you to be able to see it and record it pictorially. 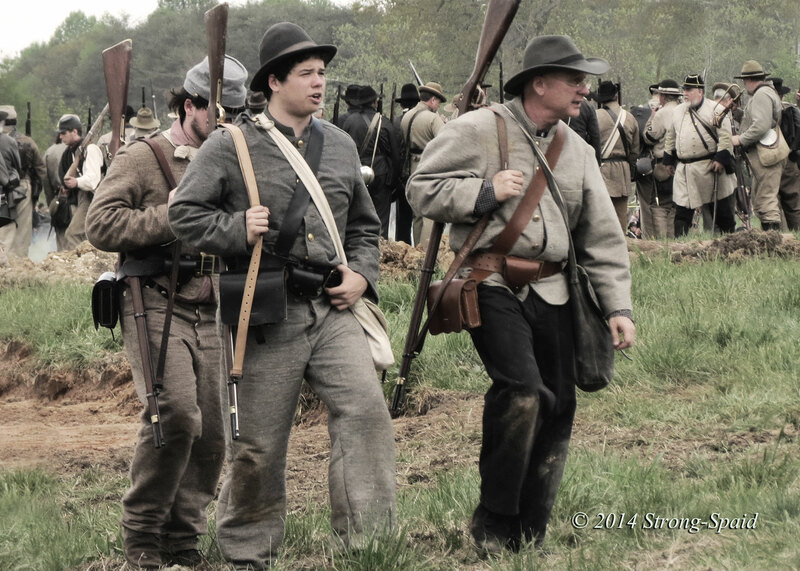 Hello, I was the reenactor in the first picture being brought to the rear. I am glad someone got to record my attempt at dying! hahaha! OH WOW…It’s an honor to meet you, Ed the Reb! You did such a great job out there that day–very realistic. I was impressed. You captured the attention of the crowd. Thanks for stopping by and leaving a comment. Now your face has a name!! Interesting. The first anti war film I ever saw, name forgotten,, about 40 years ago was about the American Civil War. Haunting, very graphic and powerful. Since the beginning of humanity, right or wrong, there have been wars. First ideas and thoughts clash….and then it gets physical. Great to see how another photographer has caught these reenactments. Well done. For me, the yellow ropes blocking off the spaces were in the way in many of the scenes and those folks with “passes” who stood in front, blocking the view. Thanks…and I know what you mean! I took almost 200 photos. The ones that I posted in this blog are the only ones that I liked. There are many others of the back of heads, backsides of horses, wayward hands or elbows, etc. It is really hard trying to get a good photos, stuck on the wrong side of the yellow tape. So good to see you on Dragonshades. So many great posts to catch up on here. I love to see how easy it is for ‘modern” people to slip back in time. Maybe it is the case that time is one great continuous loop and it is simply a case of hopping on and off whenever we want to visit. I think that’s about right. Clothes change, situations change, but emotionally people (for the most part) remain the same. One great big loop. Thanks Drew! It really was quite impressive to see. All of the people involved with recreating the battle did a great job! Just found the photos and they are super! Love the history these photos capture, Very nice! Thanks Alan….It was an interesting experience going back in time! I am utterly amazed by the amount of participants. I will recommend this event to people with children so that they too can literally step into the past. Thank you so much for checking out the Servants of Charity. It led me to your page with some amazing images! I love your photos! Sharp and close up. 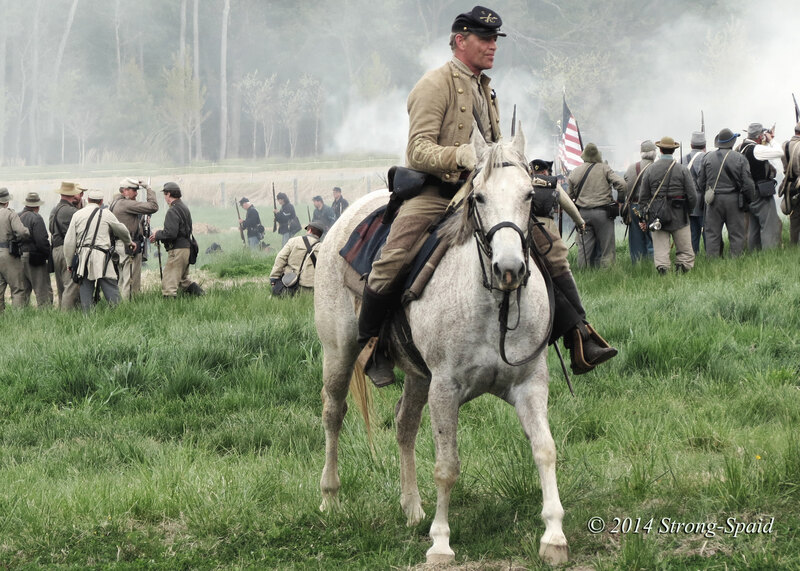 I have only been to one reenactment for this time period, “Battle of Ocean Pond or Battle of Olustee” in Florida. Same battle, just depends on which side you were on. I can only repeat what those before me have said. Excellent photography and good reporting. What a lot of work and dedication goes in that re-enactment. It really was incredible the amount of effort that they put into the reenactment! 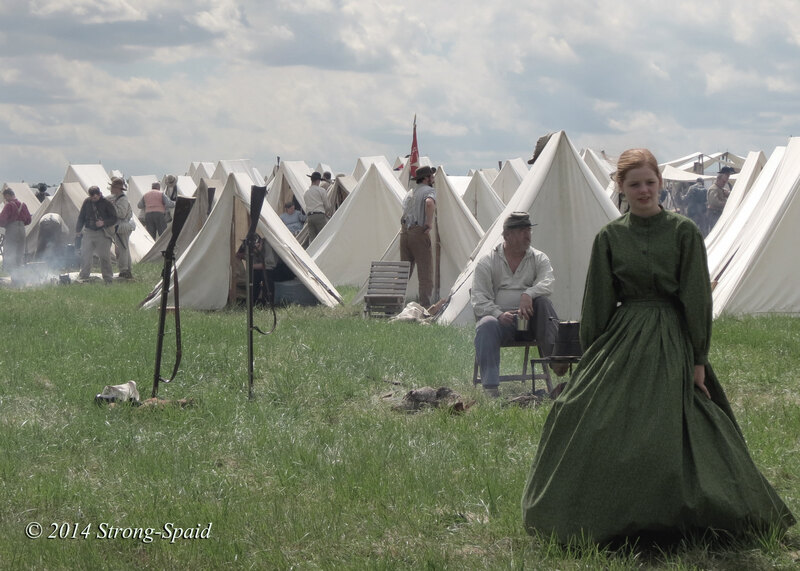 The horses, the tents, the uniforms…it was so authentic. I was totally impressed and I won’t ever forget it.